Over the past semester, freshman Taite Hylton has been juggling new high school academics with her passion for horseback riding. Taite describes being an equestrian as both rewarding and challenging. She is excited to share her story! When did you start riding horses? T: I think around ages 8 or 9. I’ve been doing it all my life. How did you become interested in horse riding? T: I’ve always loved horses, and my mom used to ride as well. How often, and where do you ride? T: Five days a week. I ride at the Paddock Riding Club in Los Feliz. What kind of a horse do you ride? T: I have my own horse. Her name is Pink and she’s an American Warmblood. She’s eleven years old and very much a diva. T: After school I get picked up at three o’clock. Then I drive to the barn and get there at around 3:20. Next I tack up, putting on all the equipment such as the saddle and the bridle, and get on the horse by 3:45. I ride for 45 minutes, and then spend another 15 untacking. T: I do dressage, where you do movements with the horse and make it look like it’s dancing. When I show in front of the judges, I have to remember in my head a certain course or specific test. 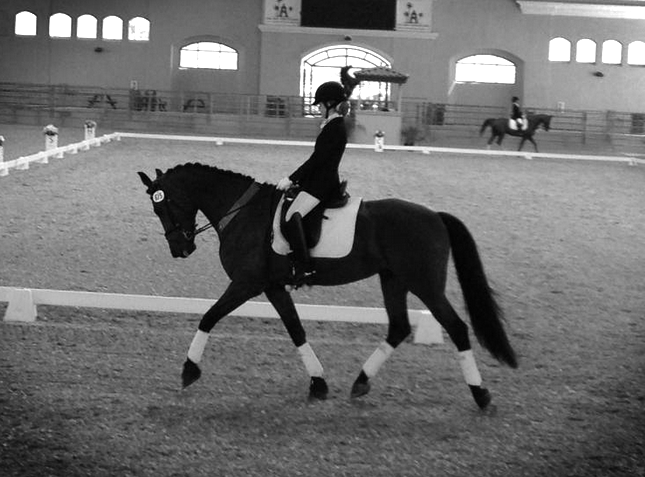 Last year, I competed in the 2012 CDS JR/YR Championships South – Training Level. This year I did the 2013 CDS JR/YR Championships South – First Level in Del Mar. As well, I compete in IEL (International Equestrian League) shows for Immaculate Heart. Do you plan on continuing? If so, how long? T: Yes, of course. I love horseback riding and want to continue through college and for the rest of my life.